We receive every product hung. 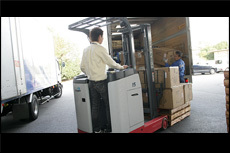 We provide several types of vehicles such as large trucks and vans. As we receive products, we count the numbers of products we received and check if the number matches as the invoice shows. Products such as Knitted clothes and Cut-and-Sews, and Bags and Shoes should be packed in boxes as we receive. We organize products in pallets gently and quickly. 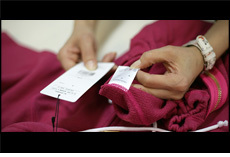 We check if the product label and laundry label show the correct information. We confirm if information on materials, country and others are correct. We check dirt, stain and other damages on every item, and check sizes and measure by each size. We provide several ways of checking as needed. 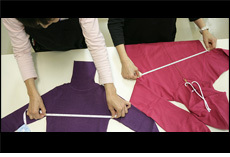 We check the amounts by model, color and size of all the products. and the imported items will be confirmed by matching with the invoice. especially jeans as often stapled when cut. Finger-touches is the only way of finding tiny pieces of cracked needles around buttons and zippers. 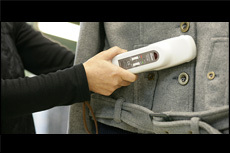 We also use the handy needle-searcher to specify the part had the induction. We also use the handy needle-searcher to specify the part had the induction when checked by conveyer type searcher. We search for dangerous objects such as needles and staples can be left in producing. using the conveyer type searcher is more economical. We make and fix the total amount of products we received and report to the client(s). We confirm and send the data of the products' supplier, model numbers, colors, sizes, and amount. we analyze and find out the best and the quickest way of doing work together. We often divide and store products by locations-for shops, for wholesale, and for mail-order dealers to avoid mis-shippings.